Many publishers find that desktop footer banners have a lower CTR than banners that appear above the fold. Usually this is because they have 3 smaller 300×250 banners in the footer position. ExoClick has created a large format 900×250 footer banner that can replace the 3 smaller banners. 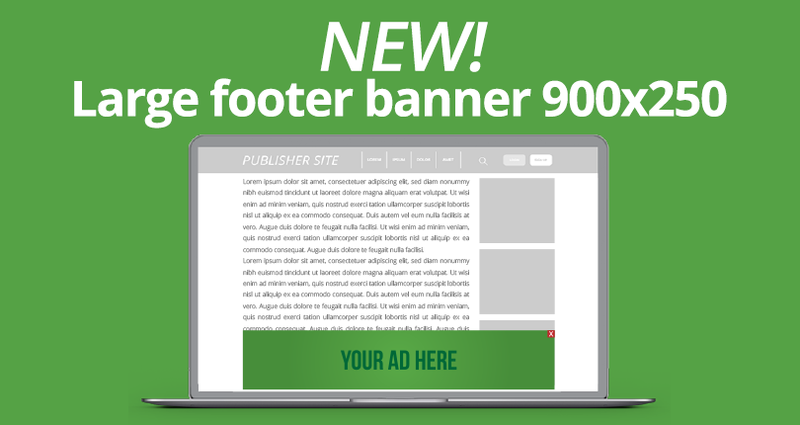 Because of its large format the new 900×250 banner is much more eye catching to users, which leads to a higher CTR allowing publishers to generate substantially more revenues. Why not carry out some A/B testing comparing 3 x small banners with 1 x large format banner? Here is our recommendation: Create a 900×250 zone with a soft CPM floor. Then create three 300×250 tags so that you can switch back to the traditional three 300×250 banners for your footer when the eCPM price for the 900×250 banner decreases. This way you can take advantage of demand for the large footer banner. Speak to your account manager or email help@exoclick.com for more information.